During Baltimore’s Welcoming Week, MIMA and its partners honored the spirit of unity and welcoming that is making our city stronger as it stands as a beacon of freedom and opportunity for immigrant and refugee communities. 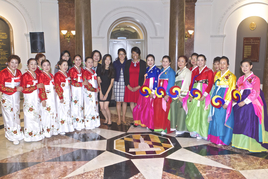 Mayor Stephanie Rawlings-Blake and members of the Greenmount Senior Center and the Korean Cultural Association celebrated the Opening Reception of the Onngi Project on September 15th. The project seeks to highlight the stories of strength and resilience of Korean Immigrants in Baltimore. The exhibit will be displayed in City Hall until October 30, 2015. This week, Mayor Stephanie Rawlings-Blake joined the International Rescue Committee at a Homeownership Ribbon Cutting Ceremony in Northeast Baltimore. 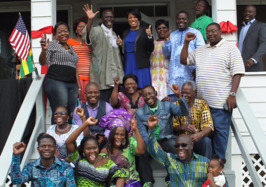 Refugees from Togo in West Africa, the Akwei family began its journey to the United States in 2003. Today, they are proud homeowners thanks to homeownership incentives provided by the City of Baltimore, Islamic Relief, The Abell Foundation and Capital Area Asset Builders and instrumental partners such as the International Rescue Committee and Southeast CDC. MIMA and our colleagues at the Bureau of Budget and Management Research encourage you to get involved with your city government by taking the 2015 Citizen Survey. Rate your satisfaction with the city and the City’s services. The Survey is available in both English and Spanish. MIMA is partnering with Baltimore’s popular newspaper Mundo Latino to produce a monthly publication in Spanish. Each month, MIMA will provide information related to services and resources available to the residents of Baltimore. This month we discuss the Baltimore City 311 Call Center. Sabia usted que varios servicios y recursos gratis de la ciudad están a su alcance por medio del numero telefónico 311 disponible para residentes de Baltimore. Last summer, both the U.S. and the Baltimore metropolitan area saw the largest influx of unaccompanied children from Central American in recent years. Subsequent media coverage and political rhetoric made the need for a historical, humanistic and accurate depiction of these children, their journey and their resilience in search of a better future. Maria Aldana, Creative Arts Manager and community artist Tanya Garcia at the Creative Alliance, in partnership with numerous stakeholders in the Baltimore area, worked to highlight the stories of these children from when they were forced out of their country of origin to the moment they arrived to the U.S. and finally Baltimore. The depth of research and diverse mix of media presented in Despues de la Frontera engages diverse audiences in its cohesive and compelling stories of unity, strength and humanity, while simultaneously creating awareness about the reasons why these children are fleeing their countries of origin. 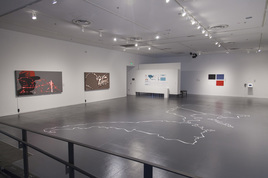 Despues De La Frontera/After the Border will be on exhibit until September 26 at the Creative Alliance and then will be traveling to Towson University. For more information on this traveling exhibit and to learn about hosting it, contact Maria Aldana at maria@creativealliance.org. Started in 1991 by a visionary group of bankers, business professionals and civil rights activists, for over 24 years, the Latino Economic Development Center has been providing comprehensive community and economic development services to build the capacity of Latino and other underserved families and communities through small business development, microlending, affordable housing preservation, annd homeownership and foreclosure counseling. MIMA, to address the need for culturally and linguistically competent financing and small business development technical services, supported LEDC expanding their services to Baltimore in the February of 2014 through seed funding from the Mayor’s Office and support from the Abell Foundation. Since that time, the organization has awarded 20 micro-loans, with seven disbursed through the Baltimore Business Recovery program, for a total of $161,500 disbursed to Baltimore-area entrepreneurs. LEDC notes that these loans have resulted in the retention of 30 jobs and anticipate the creation of an additional 16 jobs. LEDC looks forward to ongoing impact as they continue to deepen their partnerships and outreach in the Baltimore area. For more information or to contact LEDC in Baltimore, please call Rodrigo Cordon at 202-352-3373. Each year, Baltimoreans observe Hispanic Heritage Month from September 15 to October 15, by celebrating the histories, cultures and contributions that Latinos have made to our City. This annual celebration began in 1968 as Hispanic Heritage Week under President Lyndon Johnson and was later expanded by President Ronald Regan in 1988 to cover a 30 day period. The day of September 15 is significant because it is the anniversary of independence for Latino American Countries: Costa Rica, El Salvador, Guatemala, Honduras and Nicaragua. In addition, Mexico and Chile celebrate their independence days on September 16 and September 18, respectively. Baltimore City’s Latino population stands at 29, 271, according to the Census, Population, 2014 estimate. Baltimore City’s Latino Community has nearly tripled since 2000 with a population increase of 165%. The largest group of foreign born Latinos come from countries such as, but not limited, to Mexico (8,399), El Salvador (4,310), Guatemala (2,654), and Honduras (2,026) to mention a few. The following neighborhoods have experienced over a 300% increase of Hispanics between 2000 and 2010: Graceland Park - Bayview - Baltimore Highlands - Lakeland - Greektown - Brooklyn - Morrell Park - Armistead Gardens – Ellewood Park Monument. The Office of Citizenship and Immigration Services Ombudsman would like to formally inform MIMA’s partners of their role in assisting individuals and employers to resolve case problems with United States Citizenship and Immigration Services (USCIS). As a resource of last resort, assistance from the Ombudsman should only be sought when all other available means available through USCIS, such as InfoPass, e-Service Request and the National Customer Service Center, have been utilized. The Ombudsman is able to provide individual case assistance in both procedural and substantive matters by examining facts, reviewing relevant data systems and analyzing applicable laws, regulations, policies and procedures. In addition, MIMA will be submitting trends regarding procedural and substantive matters experienced by local service providers, attorneys and members of the public on a quarterly basis to their partners in the Office of Citizenship and Immigration Services Ombudsman so please contact mima@baltimorecity.gov to learn more about these efforts. For more information and to submit a request for case assistance. Explore African and African-American folklore through literature, artmaking and storytelling with masterpieces displayed in a final exhibition. (Age range for participants: 7-10 years old). Click here for more information and to register. Join local and national innovators, leaders and entrepreneurs for the fourth annual Baltimore Innovation Week, a weeklong celebration of technology and innovation. Find a track and event that meets your interests in the following areas: access, civic, creative, media, development and business. Click here for more information. Attend this citizenship work, hosted by the International Rescue Committee, to learn more about becoming a U.S. citizen and the requirements. Register by calling Laura Brown at 410-558-3260 or Liz Anders at 410-558-3191. Buying Into Baltimore offers participants a chance to meet with real estate experts and community organizations, sit in on homebuying workshops, take a narrated bus tour of Baltimore neighborhoods, preview homes for sale, AND become eligible for $5,000 in downpayment and closing cost assistance toward the purchase of a home, anywhere in Baltimore City! Register today at livebaltimore.com. 2015 marks Baltimore’s 30 year anniversary of sister city relationships with Rotterdam, Netherlands and Xiamen, China. Enjoy the daytime celebration with performances and workshops, followed by an art opening reception and networking event. Contact: committee@baltimorerotterdam.org or click here for more information. In this interactive and engaging workshop, develop a strong communication strategy to engage your audience’s heart and minds. This session is facilitated by Kate Purcell and Gayle Carney of Pulse Forward and is part of Baltimore Innovation Week. Register here. Experience Hispanic Heritage Month at the National Aquarium with live bands, traditional performances, art exhibits and Latin-inspired dishes. Find more information. Come celebrate the Historic French Quarter of Baltimore and all that is French with live French-themed music, activities for children and French food from local vendors. Find more information. Enjoy live, engaging stories, from two of the region’s talented storytellers, Mama Deborah and David Olawuyi Fakunle, including songs and movements that bring the African oral tradition to life. Find more information. October 6, 2015 (6 pm-7:30pm). Attend this informative presentation from LaCheryl Jones of the Maryland Department of Transportation’s Office of Minority Business Enterprise on opportunities for state and federally funded contracts within Maryland for qualifying businesses. Find more information. Join the exhibit’s curator Tanya Garcia, producer Maria Aldana and its panel of partners to learn more about the vision behind this exhibit, featuring the stories of recent unaccompanied immigrant youth and families from Central America. Find more information. Learn about Mr. Peralta’s journey from the Dominican Republic to the United States with his family and then the city’s shelter system to the Ivy League in this riveting presentation. Find more information. Join Ai-jen Poo, director of the National Domestic Workers Alliance, and Gustavo Torres, executive director of CASA, in this discussion about the current structure of the U.S. job market and what can be done now to advance fair labor standards for domestic workers. Find more information. JHU, Gilman Hall, 3400 North Charles Street. Learn about the policy regimes in Latin America in this seminar hosted by Kent Eaton, lecturer from the University of California –Santa Cruz & Woodrow Wilson Center for Scholars. Find more information. Learn about the Korean Immigrant Experience in Baltimore in this project created by artist Aletheia Hyun-Jin Shin. Contact: Lindsey Bishop, 410-396-8056. Attend this helpful workshop if you are new to proposal writing or need a quick refresher, include the basic, “do’s” and “don’ts,” how to follow-up and review your skills in an exercise. Register at grc@prattlibrary.org. More information.